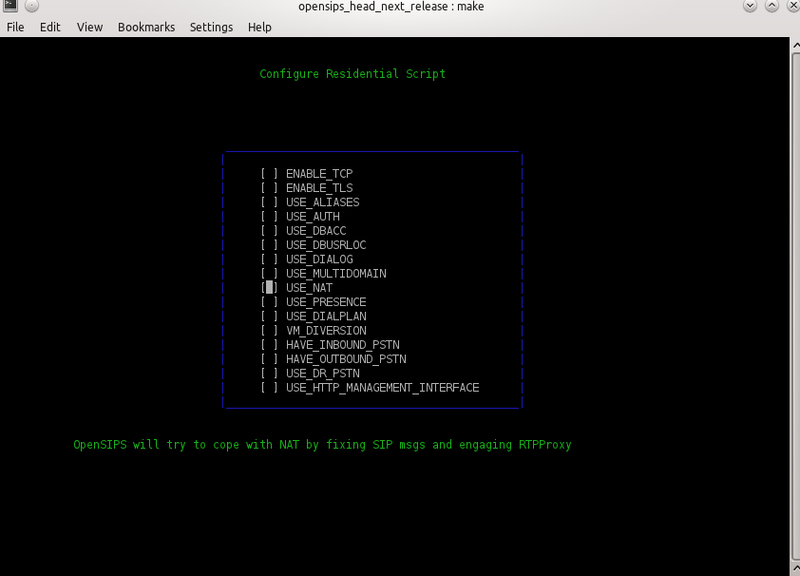 Generating OpenSIPS config files is accomplished by using the menuconfig tool. Because the graphical interface is ncurses based, please make sure to first install the ncurses development library ( typically libncurses5-dev ). After generating your OpenSIPS script with the menuconfig tool, you need to open the script with your favorite editor, and go through all the '# CUSTOMIZE ME' comments in the script. Those comments mark the places where user attention is needed, and usually refer to customizing the OpenSIPS listening address or setting the proper database URL. Upon making the appropriate '# CUSTOMIZE ME' changes, you can save your script and take it for a test drive.